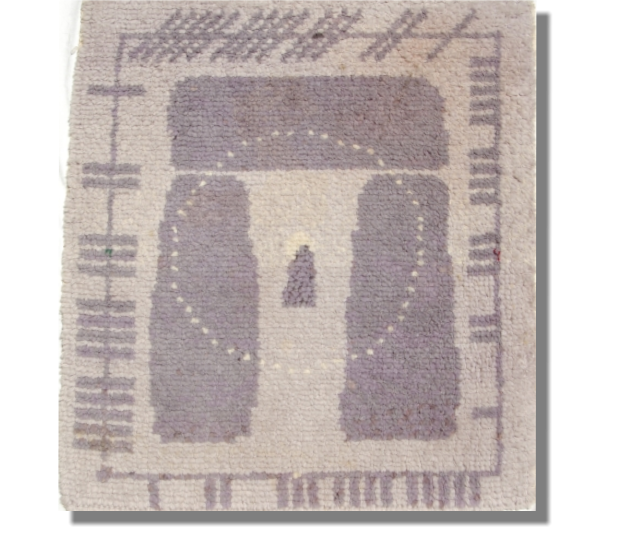 The Ogham Stonehenge Rug - my first stab, in the 1970’s © Jon Appleton 2010 My first stab at integrating the four “flights” of the Ogham “tree alphabet” with the cycle of the year, around an image of the midsummer sunrise trilithon at Stonehenge. The circle of 52 white dots which form a halo round the sun represent the weeks of the year. The Ogham letters start in the bottom left hand corner with the letter B, for Beth/Birch and run round anticlockwise, in four groups, to end with I, Ioho/Yew. Birch is the young, short lived, first colonising . As shown here the cycle of letters is B L N F S, H D T C Q, M G Ng St R, A O U E I. Ogham was a writing system that appears to have been used in Britain before either the Roman letters or the runes came here. It’s only found now on a few, probably memorial, stones where the letters are cut down the edge. tree and Yew is the old, sometimes apparently everlasting, death associated tree. Click on the rugs below to find out more about them.